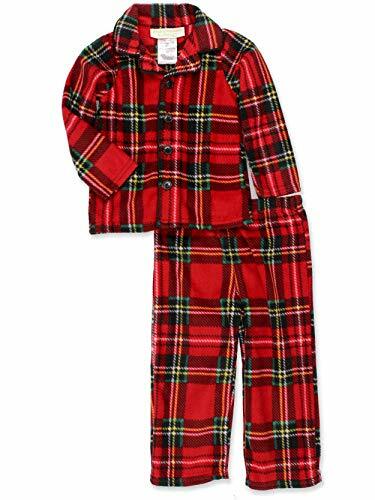 Create a new holiday tradition wearing these fantastic Komar Kids coat-style button down boy's pajamas! This 2 piece set features vibrant graphics and a beautiful red plaid pattern! This pj set features a soft flannel or fleece fabric, button down front, a fold-over collar, double stitched hems, an elastic waistband, and a colorful sublimated pattern. This is the perfect pajama set to keep your little one warm this Christmas! 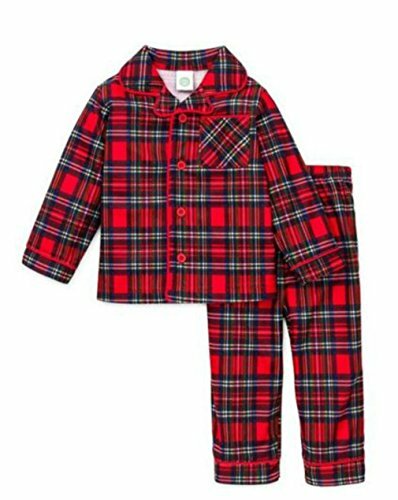 The toddler size is made from a soft fleece fabric, and the boy's sizes are made from a soft flannel fabric. 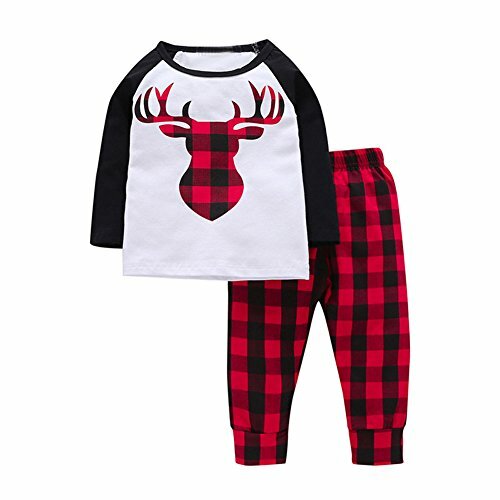 The fleece set is available in toddler boy's sizes 2T, 3T, and 4T, and the flannel set is available in boy's sizes X-Small (4/5), Small (6-7), Medium (8), Large (10-12), and X-Large (14-16). Due to intensity of colors wash with like colors before wearing. 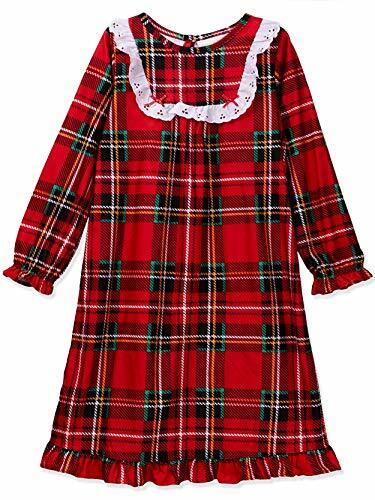 Keep warm and cozy this holiday season wearing this adorable Komar Kids girls flannel nightgown! These granny gown style nightgown pajamas feature a colorful, sublimated plaid pattern with lace, ruffles, and bows for added details! Comfy long sleeves round out this charming granny gown. With double stitched ruffle hems, this set will keep you comfy and stylish at bedtime. Granny style gown pajamas make the perfect birthday or Christmas gift. Why? They are well constructed, feature adorable holiday patterns, and are very affordable. It's the perfect gown for any sleepover! Due to intensity of colors wash with like colors before wearing. 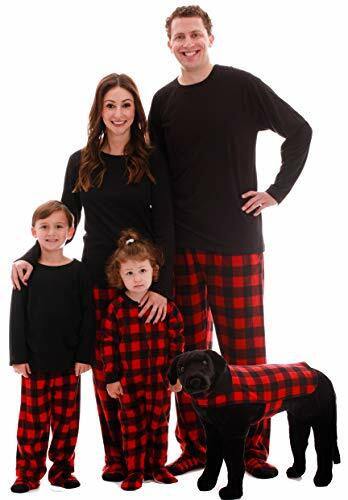 The perfect matching family Christmas pajamas! 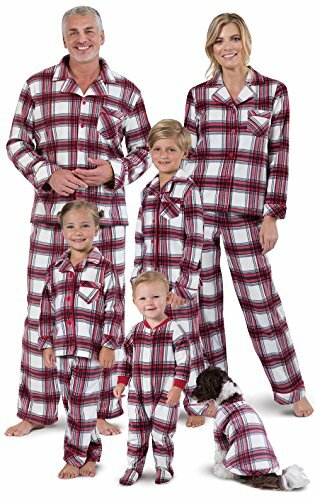 Classic and comfortable, our Flannel Plaid Matching Family Pajamas are the perfect way to get every member of the family in the holiday spirit. The Adult styles come with a cotton and polyester thermal top and brushed cotton flannel pants for an oh-so-cozy feel, even in the middle of winter. 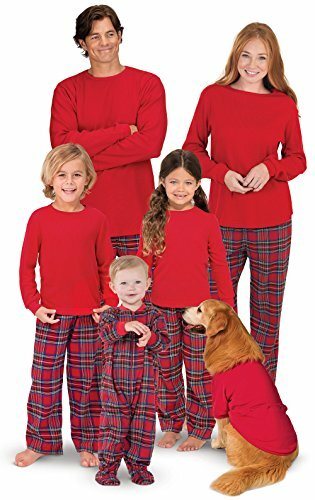 The Kids and Toddler PJs feature a polyester long-sleeve thermal top and flannel pants. Infants will look adorable on his or her first Christmas in a matching zip-up onesie with non-slip footies! For child's safety, children's sleepwear should be snug-fitting or flame resistant. This garment is flame resistant.Adult tops and Pets PJs made with 60 percent cotton/40 percent polyesterAdult pants are made with brushed 100 percent cotton flannelKids PJs are made with 100 percent polyesterCrew-neck top with long sleevesFull-length pants with elastic waist; Adults with drawstringInfant onesie has a zip front; Pets PJ has a snap closurePay one shipping price on multiple pairs. Prime members get free shipping!Personalization and PajamaGram Free Gift Packaging are not available for this item. 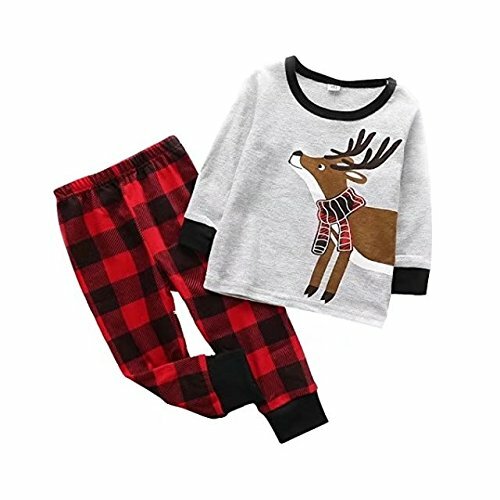 Size Chart: Size: 90/2-3T Top Length: 36cm/14.17" Bust: 54cm/21.20" Sleeve: 21cm/8.26" Pants Length: 50cm/19.68" Hip: 54cm/21.20" Size: 100/3-4T Top Length: 40cm/15.74" Bust: 56cm/22.04" Sleeve: 23cm/9.05" Pants Length: 56cm/22.04" Hip: 58cm/22.83" Size: 110/4-5T Top Length:42cm/16.53" Bust: 58cm/22.83" Sleeve: 24cm/9.44" Pants Length: 60cm/23.62" Hip: 60cm/23.62" Size: 120/5-6T Top Length: 45cm/17.32" Bust: 64cm/25.19" Sleeve: 29cm/11.41" Pants Length: 68cm/26.77" Hip: 66cm/25.98"